The Board of Directors, either directly or through its committees, bears responsibility for the stewardship of the Company. To discharge that responsibility, the Board supervises the management of the business and the affairs of the Company, including the oversight or monitoring of all significant aspects of the operation, so that the Company effectively and efficiently fulfills its mission, vision and values. The Company’s corporate governance framework, processes, structures and information are designed to strengthen the ability of the Board to oversee management, and to enhance long-term policyholder value. Every director has a duty to guide the Company’s affairs in a manner that achieves the Company’s objectives. The corporate governance processes and mandate are derived, in part, from the Ontario Insurance Act and regulatory “best practices,” and are expressed in the Company’s Corporate Governance Framework. Demonstrable evidence of independence is at the heart of effective governance. Independence is normally a matter of a board demonstrating its ability to act independently of management when appropriate. 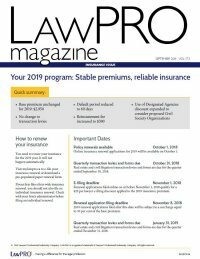 Currently, only the chief executive officers of LAWPRO and the Law Society of Ontario are “affiliated” to the Company within the meaning of applicable legislation. A minority of directors are Benchers or employees of the Law Society of Ontario. Annually, the Board reviews its composition to determine whether or not the Board is optimally structured to ensure the achievement of the corporate strategy and business plan. Also important is a regular assessment of the skills, experience and independence of those on the Board. The Board has approved a document which summarizes the Roles and Responsibilities of LAWPRO Directors. From time to time the Board must recruit one or more independent directors to fill Board vacancies. Expressions of interest to join the LAWPRO Board are welcomed throughout the year and are kept on file for two years. Subject to the Board initiating a specific recruitment process on a vacancy occurring, LAWPRO accepts submissions only through the electronic application form. Those expressing interest will only be contacted for further information if their skill sets and experience are considered relevant to the Board’s needs once a specific vacancy occurs. Expression of Interest Form (If you would like to withdraw your expression of interest, please email [email protected]. Corporate performance oversight: the Board ensures that corporate management continuously and effectively strives to meet the two opposing goals of minimizing premiums and achieving a satisfactory financial result, taking account of risk. Appointment of CEO and related human resources issues: the Board appoints the CEO and approves the CEO’s objectives, assesses his or her performance and determines compensation of the CEO. As well, the Board approves key appointments reporting to the CEO, reviews key executive performance and approves compensation policy and succession plans. Strategic direction and policy: the Board reviews and approves management’s proposed strategic direction and policy matters, and ensures that policies on key issues, including exposure to various risks, are in place, are appropriate and are reviewed to ensure compliance with same. Budgeting and planning: the Board approves the Company’s proposed budgets and other performance goals, reviews performance against goals and recommends corrective actions. Risk Management: the Board monitors all categories of risk affecting the Company’s operations, approves risk management strategies and assesses risk management performance, including the Company’s audit universe and its own risk and solvency assessment (ORSA). Regulatory compliance and financial monitoring: through an independent audit committee, the Board requires and monitors regulatory compliance, appoints the auditor, oversees the audit process and reviews and approves financial reports. The Board also ensures that financial systems produce accurate and timely information, and that appropriate controls are in place. Ensuring its own effectiveness: the Board establishes committee structures that assist the effective operations of the Board, and enable a review and assessment of the Board’s own performance. Setting an appropriate cultural tone: through its support for the corporation’s vision, mission and values and corporate social responsibility statement and its adherence to the Code of Business Conduct, the Board promotes a culture of integrity, exemplary business conduct, and due regard for the fair treatment of customers while acting in a commercially reasonable manner. The independence and performance of the Company’s external auditor and actuary. The Conduct Review Committee oversees the Company’s compliance with the related party provisions of the Ontario insurance legislation. The Executive Committee has the authority of the Board, subject to the limitations of law and those set forth in the Company’s bylaws, to consider urgent matters that require action prior to the next Board meeting. Actions taken by the Executive Committee are reported to the full Board at the next meeting. Assists the Board of Directors in liaising with the principal shareholder. Meets with and monitors the performance of external investment managers. The Risk Committee assists the Board in monitoring all risks (other than financial and solvency risks) to which the Company is subject and overseeing the development and implementation of appropriate risk management policies and programs.